Despite pleas for silence from author J.K. Rowling and some leading Potter fan sites, publishing's secret of all secrets - whether the wizard lives or dies - is in danger of becoming plain gossip as publication approaches for "Harry Potter and the Deathly Hallows." "As launch night looms, let's all, please, ignore the misinformation popping up on the web and in the press on the plot of "Harry Potter and the Deathly Hallows," Rowling wrote in a message posted Wednesday on her Web site. "I'd like to ask everyone who calls themselves a Potter fan to help preserve the secrecy of the plot for all those who are looking forward to reading the book at the same time on publication day. In a very short time you will know EVERYTHING!" Alleged images of Rowling's seventh and final Potter book have already been circulating online days before the official July 21 release. More than 1,000 actual books may already have been received by customers. As of Wednesday morning, the $34.99 (EUR 25.39) release was being offered on eBay, for immediate purchase, for $250 (EUR 181.44). "That's right - I've got one copy of Harry Potter 7, on July 17, and it can be yours as soon as July 19. Hurry! Confirmed payment by 6:30PM on July 18 will ensure delivery on July 19 by FedEx Priority Overnight!" read a message from a seller identified as "willpc" and based in Atlanta. "I don't work for a bookstore, and I don't have a magic wand - an online store shipped a copy early." Two pictures of the book, which sits upon a copy of the Atlanta Journal-Constitution, are offered as proof. The seller, who declined immediate comment when e-mailed by The Associated Press, has been an eBay member since 1999 and has a perfect "Feedback" score, according to the "Feedback Profile" for willpc. Hundreds of copies of "Deathly Hallows" are being offered on eBay, but almost all have been promised only after the book is published. Meanwhile, Scholastic, Inc. announced Wednesday that it was taking "immediate legal action" against online retailer DeepDiscount.com and distributor Levy Home Entertainment after learning that "some individuals have received copies of `Harry Potter and the Deathly Hallows' through the mail." In papers filed Wednesday at Chicago's Circuit Court of Cook County, Rowling's U.S. publisher accused the defendants, based in Illinois, of a "complete and flagrant violation of the agreements that they knew were part of the carefully constructed release of this eagerly awaited book." Scholastic is seeking damages "to be determined." Donna Coyne, Levy's director of product management, declined comment when contacted by The Associated Press. According to a Scholastic press release, "around one one-hundredth of one percent of the total U.S. copies" going on sale early Saturday morning were shipped prematurely, before the agreed upon July 20 mailing. With an announced first printing of 12 million, that would mean about 1,200 copies. One book was obtained by a reporter for The (Baltimore) Sun and a review ran Wednesday on the newspaper's Web site. Scholastic on Monday obtained subpoenas ordering two San Francisco Bay Area companies to remove possible copies of the book posted at their Web sites. Scholastic ordered Photobucket, which provides file-sharing services and has an office in Palo Alto, and Milpitas-based Gaia Online, a social networking site used mostly by teenagers and college students, to remove the material. The company would not say whether the copies were real. Gaia spokesman Bill Danon said the company gave a two-week suspension to the user who posted the possible copy and removed the material. He did not reveal the user's identity. Officials at Photobucket refused to comment, but also apparently removed the material. Despite the strictest security, digital photographs of what looks like the full text of "Deathly Hallows" have been leaked on the Internet. Emerson Spartz, the Web master of the Potter site http://www.mugglenet.com has seen some of the pages and believes they're real. "It's far too detailed to be an elaborate hoax," he told The Associated Press. Scholastic has declined to comment on the authenticity of any given spoiler. Spokeswoman Kyle Good says that conflicting editions, all of them believable, have appeared on the Internet. Hiding the contents of a book, especially when millions have been printed and shipped, has proved nearly impossible over the years. Publishers have tried repeatedly to "embargo" an anticipated work until its scheduled release date, and almost always failed. But early leaks, usually by the media, have not kept such books as Bob Woodward's "State of Denial" or former president Bill Clinton's "My Life" from blockbuster success. "I can't think of an example from our publishing list where sales were hurt," says Paul Bogaards, director of publicity at Alfred A. Knopf, which published Clinton's book. "None of the leaks are going to hurt sales of Potter." 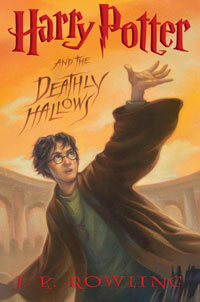 As of Wednesday, "Deathly Hallows" remained at No. 1 on the best seller lists of Amazon.com and Barnes & Noble.com.